The Marines are making strides to become more lethal and agile based on the threats of the future battlefield. At the annual Ground Awards Dinner, Commandant of the Marine Corps Gen. Robert B. Neller, offered his recent decisions to many of the Corps’ top officer and enlisted ground combat leaders. Neller added that improvements in technology, mobility, and firepower offer the Marines an asymmetric advantage against potential adversaries, but only if they seize the opportunity. The infantry has always been the heart of the Marine Corps’ warfighting capability and the Commandant wanted to ensure that Marine Corps infantry formations remain the most lethal, agile, and adaptable in the world. The MOC, Marine Corps Force 2025 (MCF 2025), as well as the associated Sea Dragon 2025 experiments and evaluations, have informed the Commandant’s decision to make several foundational decisions to increase the lethality, agility, and adaptability of the infantry battalion. Reorganization of the infantry will occur over the next three-to-five years, although some of the changes are happening now, such as the move to arm infantry Marines with the M27 Infantry Automatic Rifle and the distribution of quadcopters. One of the most anticipated changes Neller announced was the structure of the Marine rifle squad. The new 12-Marine squad reflects changes aimed at better equipping the small unit leader with increased lethality and enhanced situational awareness. It will be organized into three fire teams of three Marines each with two new positions added to account for an assistant squad leader and a squad systems operator. Additional riflemen, one for each fire team, will remain on the books (Table of Organization) as an unmanned requirement to allow the Corps to quickly add depth to the squad, if needed. Neller added that every Marine in the rifle squad will be armed with an M27 Infantry Automatic Rifle with suppressors and improved optics. The current rifle squad is built around three automatic weapons, however, the future squad will have 12. 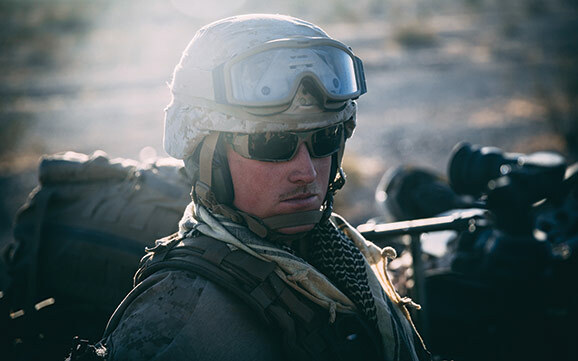 Marines will also have improved binocular night-vision devices, improved optics, including a thermal capability, and multiple improved grenade launchers (M320). Marines are fielding the Multi-Role Anti-Armor Anti-Personnel Weapon System (MAAWS), “Carl Gustav”, as a replacement to the Mk-153 Shoulder-Launched Multipurpose Assault Weapon (SMAW), for additional firepower and increased rocket range and variety. They will receive enhanced communications equipment and the Marine Corps common handheld device that provides a digital link to close-air support, indirect fires, and adjacent units to increase shared situational awareness. Each squad will also have an M38 Squad Designated Marksmanship Rifle with a suppressor and variable 2.5-8 power optic. This rifle is organizationally assigned to the rifle squad, not to a specific billet, to provide improved identification and engagement of targets out to 600 meters. The individual employing this weapon will not be a sniper, but a Marine who is given additional training on range estimation, scope theory and observation. Mk13 Mod 7 Long Range Sniper Rifle (LRSR). The Marine Corps will field a limited number of Mk13 Mod 7 LRSRs during FY18 to provide increased range and hit probability. The Mk13 Mod 7 LRSR is currently used by elements of U.S. Special Operations Command; it employs a .300 Winchester Magnum round. Each squad will have a UAS ‘quad copter’ to increase situational awareness of the squad leaders. Beyond the squads, each platoon will have an additional UAS operator, and the rifle companies will add a UAS/Counter-UAS section of five Marines. Weapons companies are going to get four additional Javelin systems bringing the total to 12. Javelins are man-portable, anti-armor missiles; Javelins will have extended range with the command launch unit. This is to off-set the elimination of four Tube-launched, Optically-tracked, Wire-guided (TOW) missiles in the company, and the eventual elimination of TOWs in the battalion. The Commandant also announced the decision to reduce the number of 81 mm. mortar systems by two in each weapons company, as eight was a hold-over from days when we had four rifle companies in the battalion. The six remaining will have extended ranges through ammunition improvements, and Marines will leverage the Polaris MRZRs (all-terrain vehicles) for enhanced mobility. 2nd Tank Battalion will get an additional tank company, and the Corps is upgrading its M1A1 active protection systems and target acquisition and sensor suites. 5th Bn, 10th Marines is coming back as a High Mobility Artillery Rocket System (HIMARS) Battalion, with plans to stand up this unit in FY23. Marines are fielding the Light Armored Vehicle Anti-Tank Modernization (LAV-ATM) upgrades – improved weapon systems, ability to acquire targets while on-the-move with a precision long-range anti-armor/anti-materiel capability, using an advanced thermal sight and guidance system. Each rifle company will have an Operations/Intelligence section, as well as a logistics cell and a Small Arms Repairer (Military Occupational Specialty designation 2111). At the battalion level, Marines are adding an Information Management Officer and an Information Environment Operations Officer and Chief to integrate Information Warfare capabilities. Combat Engineer squads will increase to 13 Marines, and each infantry battalion will have an engineer platoon aligned to it. With an additional FAC assigned to each infantry battalion, each rifle company will have an assigned FAC.